Louisa was a remarkable character, a very determined woman and she and her poet son could never see eye to eye. Apart they remained friendly; together they were at daggers-drawn. They had many and fierce arguments and eventually Harry left home. 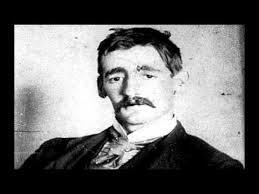 Henry Lawson was born at Grenfell [NSW], in a tent, on June 17, 1867. A “birth in a mining camp … was such a novelty, that every digger visited the home to ask to see the baby and to leave generous presents.” Bertha describes Lawson’s antecedents and upbringing, and it is important in light of Lee’s argument to emphasise just how much time Lawson spent in the bush, both growing up and as a young man. Lawson spent some time in bush schools, though was often truant or helping his parents with work, and then his deafness, caused by illness, also intervened. Louisa had some poetry published in a local paper and Lawson, aged around 10 or 11, attempted some as well but his father objected to his “vaporisings” and they were thrown in the fire. At 14 he was working full time for his father who was a building contractor in country towns west of the Blue Mountains. His education was only resumed after Louisa left her husband and moved to Granville where Henry, then 16, was able to attend night school 3 nights a week. Within a year he had a poem about a shipwreck then in the papers (The Wreck of the Derry Castle) accepted by Archibald for publication in the Bulletin. Lawson made a number of attempts to matriculate so he could go on to university, but failed, about which he was always bitter: “I was taught too little? I learnt too much/To use a pedant’s diction” (Lawson, The Uncultured Rhymer to His Cultured Critics). He drifted in and out of employment until at 19 he returned to working for his father, at Mt Victoria. There “he learnt to drink and found that under the influence of liquor he forgot his shyness”. When his father died at the end of 1888, Lawson completed his contracts and returned to Sydney, drifting again, but keeping on writing, and for a while working as a columnist in Brisbane. Bertha doesn’t say so, but Lawson was becoming well known (see my earlier post Poetry Slam, Lawson v Paterson). In 1892 he borrowed some money from Archibald and took off for Bourke and subsequently Hungerford in far north-west NSW looking for work. His mate Jim Grahame wrote in the Bulletin in 1925 that he and Lawson tramped around the country west of Bourke working as rouseabouts (picking up fleeces, not shearing as was sometimes reported) for six months, before Lawson returned to Sydney by train as a drover with sheep going to the abattoirs at Homebush. In 1895 Bertha was an 18 yo nurse from Bairnsdale, Vic, in Sydney visiting her mother. A friend introduced her to Lawson who became very persistent in pursuing her and they were soon planning to get married. By this time he had two books of short stories and poetry to his credit and a third, In the Days When the World was Wide, was with the printers. The future was looking rosy. After a couple of hiccups, Bertha’s mother gave her consent and the two were married on April 15, 1896. Harry took pencil and paper, and while I sat and sewed, or rowed slowly, he wrote verses, chanting them softly to himself, to get the beat and rhythm. This was different from when Harry wrote verse at home, for then he would dictate it to me in that sing-song way of his, and after I had written it down, while he paced to and fro, he would correct it and read it to me. In Sydney Lawson’s drinking mates were a problem, and with an introduction to the Premier, they moved on again, to New Zealand. A job was found for Lawson, as the teacher at an isolated Maori school where Bertha conspired with the locals to make it difficult for Lawson to get to the ‘bright lights’ of Kaikoura 12 miles away on the coast. Here she says, Lawson did some of his best work, all of Joe Wilson and His Mates, a play, and some poetry, including Written Afterwards in which he jokes about the restrictions imposed on him by marriage. At the beginning of 1898 they returned to Wellington where their son, Jim was born and on to Sydney, where Lawson freelanced for a while till he found work as a clerk with the Government Statistician and gave up the grog. Despite his boss telling him he only had to show up during working hours and he could write what he liked, this lasted just one week! Another book came out, there was another advance to spend, and another baby, Bertha (b. Feb 1900). Lawson was getting good reviews in Britain, the State Governor offered to pay his passage, and soon the family were on the move again (taking with them of course the ms for My Brilliant Career). Lawson however made little attempt to take advantage of the opportunities opening up for him. And after two years on the wagon, on arrival in London he started drinking again. Friends had found housing for them, but “with all this appreciation we still had not enough money to buy food”. Mary Gilmour, her husband and child came to stay (after the failure of New Australia). “We were all in deep financial difficulties”. Then Harry got an advance from Blackwoods (publishers) and Bertha “lost no time buying passages for myself and the children for Australia”. Lawson followed soon after. They met up again in Colombo but by the time they were back in Australia the marriage was very nearly at an end. Bertha stayed in Melbourne for six weeks, while Henry went on to Sydney; they lived together for a while in Manly, but first Henry, then Bertha, was hospitalised for long periods; their furniture was seized for arrears of rent; a third baby died at birth. He had his happy times and I think those periods were usually associated with absolute freedom from responsibility and full expression of his genius. He hated to be tied down. In this period, immediately before the Great War, Lawson had published a prose volume “The Rising of the Court” and a book of verses “Skyline Riders”. For a while during the War, the government gave him make-work, writing advertising for the Leeton irrigation area. Bertha goes on to analyse Lawson’s writing, his connections to the working class, where she and he fit into his stories, particularly the Joe Wilson stories, and his links to the Australian ‘Bohemians’. Lawson died in 1922, of cerebral haemorrhage. He was given a State Funeral and according to Bertha, was buried in the grave that had been prepared for Henry Kendall. This excellent little book ends with a previously unpublished Lawson short story, A Wet Camp. I’ve been proof-reading essays recently for both my student daughters. Geology daughter has me full bottle on tectonic plate movements in the Timor Sea while Psych daughter has been raiding my bookshelves for her final Australian Lit. unit. Her most recent essay was on the ‘debate’, or duel by poetry, in the pages of The Bulletin in 1892-3 between its two most important young contributors Henry Lawson, then aged 25, and Banjo Paterson, 3 years older. While on its surface about the relative merits of the City and the Bush, the debate is actually an illustration of the clash between upper and lower class perspectives. In the lead up to Federation, Australia was developing its social and political identity. Events such as the great drought, the depression and the Queensland shearers strike were heavily influential in the formation of social and political tensions. As a result, the identifying image of the Australian Bushman, which featured heavily in the literature of the time, and particularly in The Bulletin, began to take on different meanings according to class perspective. Both authors experienced the bush in their youth but moved to Sydney while still young. Lawson was the son of a struggling bushman with a small holding near Bathurst. After his parent’s marriage dissolved he moved to Sydney with his mother, Louisa, where due to his limited education he struggled to earn a living. Paterson, the son of a wealthy pastoralist, was sent to Sydney Grammar School and subsequently qualified as a solicitor. The opposing class views of the authors is clear in their writing with Paterson idealising Bush life and Lawson focusing on the difficult circumstances of ordinary working people. Lawson begins the debate with Borderland (later retitled Up the Country), detailing the differences between the idealistic poetry of the time and the realities of bush life. He proclaims his disappointment that he could not find “the Southern poets’ land” and later claims that the only way this idealised land could exist was if “the plains are irrigated and the land is humanised”. Paterson replies contemptuously with In Defence of the Bush, parodying a sympathetic response to Lawson’s disappointment. He describes the changing of the seasons with reverence and implies that it is Lawson’s lack of toughness that disqualifies him from understanding these changes and that he could never be a real bushman “who is loyal through it all”. He contrasts the pristine bush with the “squalid” city with its street urchins and immoral women. Paterson uses the Bush versus the City as a metaphor for his social belief; that the ideal bushman accepts his place in the social order with grace, and is morally upstanding while the City promotes moral corruption, particularly in women. The second poems from both authors are more aggressive but also show an element of self-consciousness. Lawson’s reply is heavily laden with his social/political views. He scorns Paterson’s ‘patriotic’ idealist images as “British workman nonsense” (Lawson, ‘In answer to Banjo, and otherwise’ ) highlighting the ridiculousness of Paterson’s idealised seasons in the face of ongoing drought. He further demonstrates that Paterson’s re-created bushman both suffers the corruption of power inequality and is analogous to the city workers. He suggests that not only is idealism an unattainable “Eldorado” but that writing of the unattainable may “raise a just rebellion in the over written west”. He further aligns Paterson himself with the falseness of idealism, pointing out that Paterson’s experience of the bush is “travelled like a gent” and “it’s doubtful that you ever saw a season in the west”. Referring to Paterson’s position as a well-connected city solicitor, he claims “the city seems to suit you while you rave about the bush”. The earnest, gritty reality of this poem and in particular his response to Paterson’s attacks on the morality of inner-city women, give the feeling that he is appealing personally to the readers in an attempt to validate their reality. Patterson’s final response addresses the authors who have joined the fray on Lawson’s side. He opens with a comic attack on their negativity and the weakness of their writing, claiming they should “take something for their livers and be cheerful for a change” (Paterson, ‘In answer to Various Bards’) For himself, he could “never see the bushman through an atmosphere of gloom”, and falls back on his idealist values of strength and morality,”‘there is no denying that the bushman’s life is rough but a man can easy stand it if he’s made of sterling stuff”. He implies that if they need comfort and dislike the bush, Lawson and others might as well go back to England. This argument does not directly address any of Lawson’s points but rather appears to be a self-conscious and defensive attempt to undermine Lawson and win back the readers. The attempt to twist Lawson’s meanings to suit his point rather than argue in kind gives Patterson’s writing a sulky or petulant feel. The conclusions on both sides, while ostensibly conciliatory, give clear summaries of the two opposing views. Lawson suggests their argument is not in keeping with “the spirit of the times” and suggests they “go together droving and returning if we live, try to understand each other while we liquor up the div”. The idea of two men of opposing class views uniting in understanding and celebration parallels his belief in the empowerment of people through action in unity. Paterson however argues for retaining the status quo, “there are some that like the city and there are some that like the bush” and that “we’ll work our own salvation with the stoutest hearts we may”. Interestingly, it was only after this debate that Lawson packed his swag and spent 6 months working in shearing sheds around Bourke, probably the first time he had ever been west of Bathurst. In re-evaluating the place of women writers and women’s writing in the Australian canon there are many C19th women to consider but I will start with Barbara Baynton (1857-1929). Principally a short story writer, writing in the 1890s, Baynton does not belong to the dominating legend which is supposed to have originated in that period. Her contribution to Australian literature is unique although she echoes in her writing much of what [Henry] Lawson and [AB] Paterson felt. Introduction to Barbara Baynton, Bush Studies, other stories, Human Toll, verse, essays and letters, Edited by Sally Krimmer & Alan Lawson. Baynton was born in rural NSW to Irish immigrant parents (ADB here). Her father was a carpenter and she was educated at home, well enough that for a while she worked as a governess. She married and had children, the husband ran off with her cousin, she remarried to a much older, well-off Sydney doctor, Thomas Baynton, and began writing, Her first published story was The Tramp (later revised and renamed The Chosen Vessel) which appeared in The Bulletin in 1896, ie when Baynton was nearly 40. 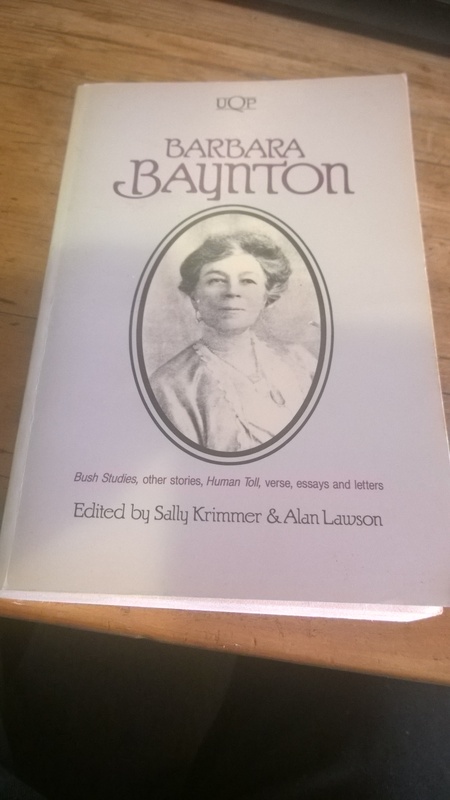 In all, Baynton wrote just one volume of short stories, published as Bush Studies in London in 1902 (republished as Cobbers in 1917 with the addition of a couple of war related stories), and one short novel, Human Toll (1907). Squeaker’s Mate, her best known short story, was first published in the Bulletin (in 1897?). Although Baynton is sometimes compared with Henry Lawson, her vision was bleaker, she was far less prolific and, of course, she hasn’t Lawson’s advantage of endless republication and anthologizing. It is revealing to compare the contemporaneous Water Them Geraniums, by Lawson with Baynton’s Squeaker’s Mate. Both have traditional bush settings but Lawson looks at the cost, to the woman, of adhering to the stereotype, of being a good wife; and Baynton at the cost of non-conformance, at the cost of independence. The woman at the centre of Squeaker’s Mate is unnamed, except as an aside in the last few lines, as if to underline her lack of independence, and yet she is the strong one: “She was taller than the man, and the equability of her body contrasting with his indolent slouch accentuated the difference.” Her money is used to finance their ‘selection’ and her labour to keep it going. Typically, when her back is broken, she is chopping down a tree while Squeaker is off looking for honey. When she is taken home on a sheet of bark, when the neighbouring selectors’ wives stop calling, when Squeaker sells off her flock to buy grog and flash new clothes, even when she is deposed to the back hut by Squeaker’s new mate, what is being described is her apparent dependence, her complete inability to move and fend for herself and yet, at each step, what we see is her independence, the indomitability of her spirit. And in the end, when her dog chases away the new ‘mate’ and fastens its teeth into Squeaker’s hand, she is acknowledged for the first time as a person, “Call ‘im orf, Mary, ‘e’s eating me”. Henry Lawson was undoubtedly the most influential Australian writer of this period, and I have even seen him praised, nonsensically, as “the doyen of Australian novelists”, but his prestige was never really matched by his output. While the Joe Wilson stories for instance might have been made up into a cohesive whole as a novel, Lawson apparently lacked the application and, in the end, wrote only short stories and poetry. The collection, Joe Wilson and His Mates, which includes Water Them Geraniums, was published in 1901. Over the course of a couple of stories Joe Wilson has wooed and married Mary and they have taken up a selection near Gulgong (an old gold-mining town in mid-western NSW). Mary has persuaded Joe to give up both the grog and fossicking for gold but he still works as a carrier with a couple of draught horses and a broken down wagon, and is away a lot from home. Ostensibly, the story is about their neighbour, Mrs Spicer, her pride despite her poverty, and her decline into despair and eventually death as she loses her husband and older sons – mostly to the police for horse stealing; but the real story is Mary’s own despair and the decline of her and Joe’s relationship, which Mrs Spicer’s story only serves to highlight. Before their marriage, Mary was working in a squatter’s house as one of the family, and was a “little dumpling” with big, dark eyes and (hence) the nickname “Possum”, but now, three or four years and two children later, living in a little hut in the bush, she is thinner and depressed. Joe is aware that this is the result of isolation and worry (about his susceptibility to alcohol); and so we see that Lawson is aware that the romance of the independent bushman is built on the destruction of family life but, perhaps in line with his own decline into alcoholism, he is unable to suggest a way out. Joe foreshadows Mary’s eventual death, “But the time came, not many years after, when I stood by the bed where Mary lay, white and still”, in direct contrast to Baynton’s Mary who insists on living on despite the seeming hopelessness of her position. See also Whispering Gums who writes, ” Author and blogger Karen Lee Thompson commented on my tournament post that she’d like to see a bout comparing “Squeaker’s mate” (1902) with Henry Lawson’s “The drover’s wife” (1892), and it would be delicious. I was tempted to do it here but I won’t.” If you put ‘Baynton’ into her search you will see that WG has written quite a few posts on (or mentioning) Baynton. And ditto for ANZ LitLovers. For her review of Bush Studies see here.